My only previous visit to Lisbon was in 1998 when I spent a weekend there before heading to the north of Portugal for the wedding of two friends. I don't have strong memories of that visit apart from the trams — called eléctricos — and the general run-down appearance pf the city (similar to what I observed in Porto a couple of days ago). 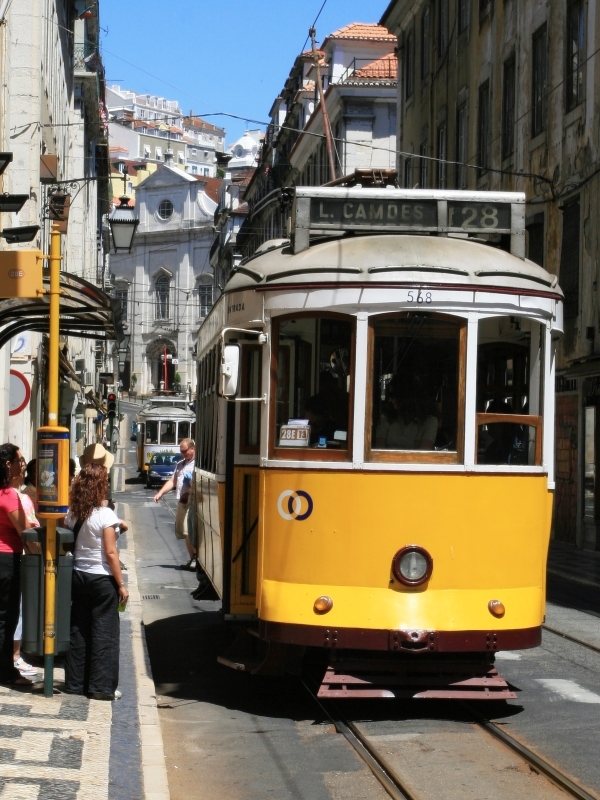 Well, the trams are still running, but the atmosphere seems to have changed in Lisbon. Recession or not, the city seems to be thriving. I spent a very pleasant two days there exploring the centre of the city — squares and boulevards, but mostly back streets — with no particular objective in mind other than to see whatever I'd see. I wandered up and down the hills — they really are steep — and when I got tired I'd take the first tram that came along and see where it took me. I like that idea of getting intentionally "lost" in a city. Of course you never really get lost as you can just take the same bus or tram back. These old wooden trams are a perfect size — just one car, four wheels, 900mm gauge — for trundling through the winding narrow streets, with sometimes only a couple of centimetres to spare between coaches when they pass each other. In fact some of the streets are so narrow and corners so tight that the tram almost shaves the walls. The sign inside says not to lean out the windows. A few passengers almost learnt the hard way why. My favourite tram is line 28. 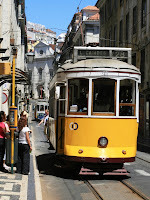 I caught it in the Bairro Alto, one of the hill-top quarters to the west of the centre. It was packed with tourists like me, and I'd say not a single Lisbon-dweller. It descended slowly to the centre (sea level) and then wound its way up the hill on the other side, past Castelo de São Jorge, through the narrow streets of Alfama, to the charming district of Graça. I still didn't know where it was going so I stayed on board until it finally came to its terminus at Martim Moniz, a short walk from my hotel! That evening I had the best meal of my four days in Portugal in a place called Baleal, in Rua da Madalena, 265. It's an unassuming place, described as a restaurante-cervejaria. At the entrance there are several aquariums showing off some of the options for dinner. It's in a quiet street just far enough from the main drag that not many tourists seem to find it. This one did, and the prawns and cod were delicious!